King Herod, the most powerful and wealthy man in Judea, had everything he wanted, apart from a clear conscience and peace with God. Herod had respected and feared John the Baptist as a great prophet and servant of God. John, however did not fear to rebuke Herod for his disloyal relationship with his brother's wife. He ended up in prison because of Herodias' jealousy. Herod, out of impulse and a desire to please his family and friends, had John beheaded. Now his conscience is pricked when he hears that all the people are going to Jesus to hear his message of regret and to see his mighty works. Herod is now haunted by the thought that the prophet he murdered might now be raised from the dead! Unluckily for Herod, he could not rid himself of sin by ridding himself of the man who tackled him with his sin. Herod's power was badly faulty. He could take a strong stand on the wrong things when he knew the right. Such a stand, however, was a sign of weakness and weakness. Where do we get the strength of will and heart to choose what is right and to reject what is bad? 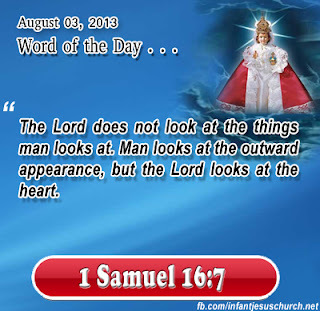 1 Samuel 16:7 The Lord does not look at the things man looks at. Man looks at the outward appearance, but the Lord looks at the heart. Heavenly Father, thank you for the new day. Lord, you alone know each heart of everyone. Please help us be more patient with others before forming an opinion about them. Please give us eyes to see them as Jesus did. In Infant Jesus' name we pray. Amen. 1At that time Herod the tetrarch heard about the fame of Jesus; 2 and he said to his servants, "This is John the Baptist, he has been raised from the dead; that is why these powers are at work in him." 3 For Herod had seized John and bound him and put him in prison, for the sake of Hero'di-as, his brother Philip's wife; 4 because John said to him, "It is not lawful for you to have her." 5 And though he wanted to put him to death, he feared the people, because they held him to be a prophet. 6 But when Herod's birthday came, the daughter of Hero'di-as danced before the company, and pleased Herod, 7 so that he promised with an oath to give her whatever she might ask. 8 Prompted by her mother, she said, "Give me the head of John the Baptist here on a platter." 9 And the king was sorry; but because of his oaths and his guests he commanded it to be given; 10 he sent and had John beheaded in the prison, 11 and his head was brought on a platter and given to the girl, and she brought it to her mother. 12 And his disciples came and took the body and buried it; and they went and told Jesus.